Eat Skinny! We Craft Zero Sugar, 0.5 – 2.5 Net Carbs, Stevia Sweetened, Keto Friendly Dark Chocolate! "How can there possibly be no sugar in your chocolate?" It's the question we hear constantly! But it's true. SkinnyMe sugar free chocolate has been formulated from an original recipe that contains absolutely zero sugar and yet still has the full flavor of a luxury gourmet chocolate. All of our amazing sugar free chocolate flavors have been masterfully designed by our team of gourmet chocolatiers and experienced nutritionists. Over the years we took note of all the information flooding in about how toxic sugar is on our bodies. After attempting to go cold turkey ourselves on all products with sugar, not only were the cravings and sugar withdrawals crippling, but it felt like all the foods we loved were permanently off the table. But what if being sugar free meant not having to give up on the things you love (like chocolate)? Living sugar free means making informed choices and decisions about what you put into your body. Was there a way we could recreate what we so passionately love ourselves (chocolate) and completely eliminate all sugar from the equation? This question gave birth to an ongoing quest that led to over a year of research and recipe formulations with one goal in mind... To create chocolate that tastes just like the kind we love but without the ugly, toxic, fattening effects of regular sugar. We searched high and low for a natural sweetener to add a little flavor to our lives but the results were devastating. As we waded through numerous sugar alcohols, like maltitol, the stomach pains and numerous side effects were enough to make us want to give up! That’s when we stumbled upon Stevia, a naturally occurring zero-calorie sweetener. Stevia is a green, leafy plant that’s primarily grown in South America and has been used for medicinal purposes for centuries. This 100% natural, zero calorie sweetener even comes with a list of health benefits, one of the most important being that it doesn’t affect blood sugar or insulin levels! If you've had any experience with sugar alcohols, you might know that they can cause stomach cramping and digestion problems. That's the LAST thing you want to worry about when enjoying chocolate. It was amazing to us to find that so many sugar free products available in stores use maltitol. In our opinion, maltitol is just downright awful stuff. So right away we knew it was very important for us to avoid using it at all costs. We researched and researched until settling on a special sugar alcohol called erythritol. Erythritol is a naturally-occuring molecule that can be found in fruits such as pears, water melons and grapes. Erythritol contains a variety of benefits, including zero-calorie content and a low GI index. Best of all, erythritol doesn't have the nasty side effects of maltitol, as more than 90% of it is absorbed in the small intestine, so minimal amounts reach the colon - thus not likely to cause stomach & digestion and discomfort. Gayle Reichler, MS, RD, CDN, is the lead nutritionist and formulator for SkinnyMe Chocolate. As nutrition consultant to Avon Products, Inc., Reichler is well known to the six million recipients of their wellness catalogues. She has appeared on television shows such as The View and CBS News; is a contributing writer to "Women's Day" magazine; and has been featured in national newspapers and magazines, including "The Wall Street Journal," "Redbook," and “Glamour. According to Gayle, "When you look at the total carbohydrate in a food item, it is important to also look at the ingredients to learn where the carbohydrate is coming from. Not all carbohydrates affect your blood sugar in the same way. You can use the glycemic index of foods to learn how likely a food item is going to affect your blood sugar, the higher the number the more it will affect your blood sugar when eaten alone." "In SkinnyMe Chocolate, the carbohydrates are coming from Stevia, Erythritol, and the unsweetened chocolate." "Stevia and Erythritol both have a glycemic index of ZERO meaning they don’t affect your blood sugar. Unsweetened chocolate is a low glycemic index food coming from the seed of the Cacao plant. Research shows that unsweetened chocolate is high in flavonoids and phytonutrients including polyphenols with very powerful anti-inflammatory properties, that may improve insulin sensitivity." All of our products contain a total net carb count ranging from just 0.5g to 2.5g per piece. Since the majority of our "total" carbohydrate counts are coming from the Stevia, Erythritol and chocolate - you can rely on the net carb total to to determine how you'd like to manage the carbohydrates into your diet. Net carbs are calculated by subtracting (total carbohydrate - total fiber - total sugar alcohol). This is great news for anyone on a carbohydrate restricted diet. After all was said and done, we feel we have created a very special product. All of our squares and truffles taste just as good (if not better) than any of our competitors who are using regular old toxic sugar, and we were able to do it while completely avoiding sugar and keeping the calories and carbs LOW!! SkinnyMe Chocolate has become the perfect anytime sweet treat for so many different types of people! Trying to lose weight? On a low carb diet? 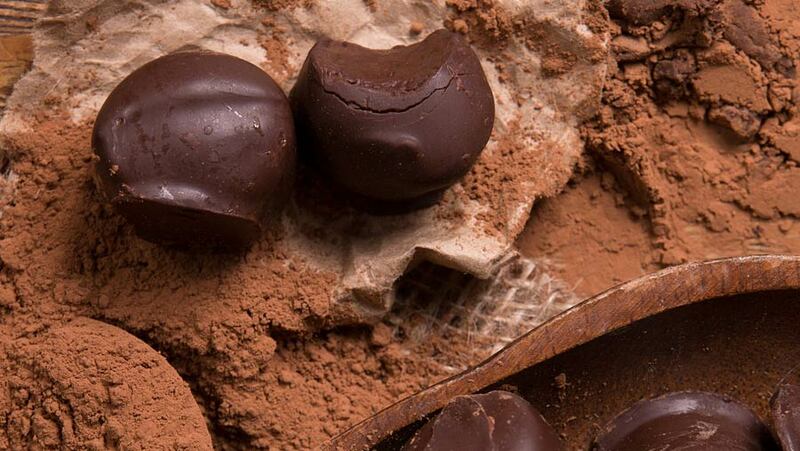 Love chocolate, hate sugar? 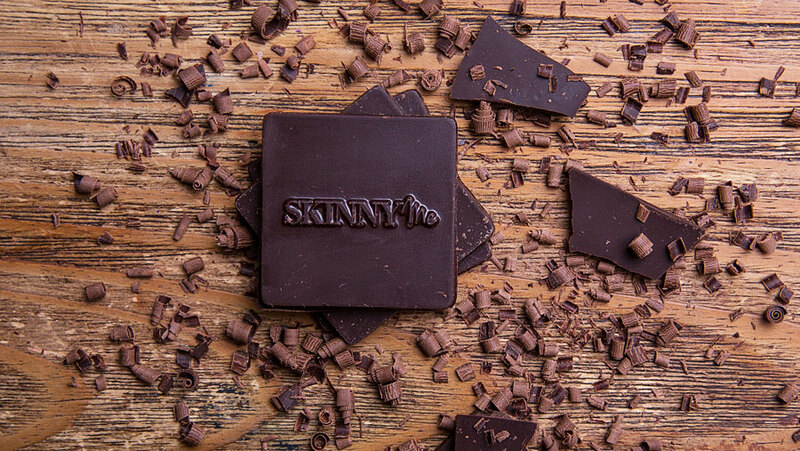 No matter who you are, we know you'll LOVE SkinnyMe Chocolate! The best part is that dark chocolate alone is an incredible super food with many known health benefits. 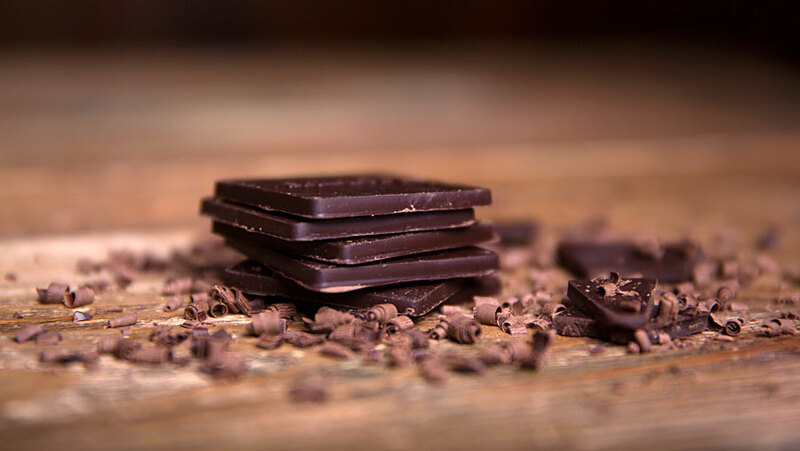 A Harvard study, presented at the American Heart Association meeting in 2011, found that a small daily dose of dark chocolate (containing at least 50 to 70 percent cocoa) lowered blood pressure in all people, but particularly those who already had high blood pressure. The study also showed that dark chocolate improved insulin sensitivity, decreased LDL (bad) cholesterol, and increased HDL (good) cholesterol. Here's a movie trailer we found to be very informative (see below). Thanks for visiting SkinnyMe Chocolate! Try our sugar free squares or truffles today and make sure to tell us what you think!